The Altmer are the most strongly gifted in the arcane arts of all the races. They are among the longest living and most intelligent races of Tamriel, and they often become powerful magic users due to both their magical affinity and the many years they may devote to their studies. Also known as "Altmer" in their homeland of Summerset Isle, the high elves are the most strongly gifted in the arcane arts of all the races. They can call upon their Highborn power to regenerate Magicka quickly. Highborn greater power (FormID 000e40c8): Regenerate magicka faster for 60 seconds, once per day. Base Magicka Regeneration is increased by 2500% for 60 seconds. Resist FatigueCC (FormID xx000874): Your High Elf blood gives you 25% resistance to fatigue. In addition to Flames, Altmer start with the spell Fury. Altmer are arguably the best choice for a pure Mage character and possibly any character intending to invest in magicka. The largest advantage is the additional 50 magicka as this essentially gives you 5 more levels worth of magicka, which either makes your large pool even larger or allows you to put those 50 points into another stat. They also no longer have the additional weakness to magic that they have traditionally had in previous Elder Scrolls games. With small bonuses to all the magical skills and a larger bonus to Illusion, they can reach the cost-reduction perks much faster at the start of the game. Their racial power, Highborn, can be incredibly helpful in situations where you have run out of magicka against a tough opponent and just need a little more to finish them off. Despite the Thalmor being comprised almost entirely of Altmer, being Altmer makes almost no difference in their interactions with the player -- you can disguise yourself more effectively during Diplomatic Immunity, but there is little outside of this; most Altmer will still act like they believe themselves to be a superior race to you and Thalmor will express no sympathy to the player if they are an Altmer and even regard them as being a "disgrace to your own kind". Even though many factions in Skyrim show disdain for the Altmer - the Empire just fought an extremely brutal war with them - the Dragonborn will be spoken to in the same manner as any other of the Elven races (i.e. interactions with guards may prompt them to address you with "Speak, Elf"). Few others will ever notice your race or mention it to your face. 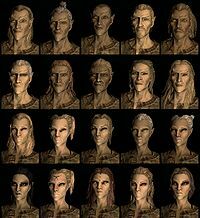 There are many Altmer in the Empire, loyal citizens or refugees from the Thalmor oppression. They can even be found holding high positions in the Imperial forces, such as Legate Fasendil. Unlike all other races, there are no Altmer bandits in Skyrim. The Altmer are the only race to have a natural attribute bonus. Unlike previous Elder Scrolls games, in Skyrim, Altmer are not vulnerable to magic, nor are they resistant to disease. They have the greatest run speed and jump height due to their increased height relative to the other races (1.08). There are no Altmer in the game, including any official add-ons, that will be your follower. This page was last modified on 22 November 2018, at 03:15.